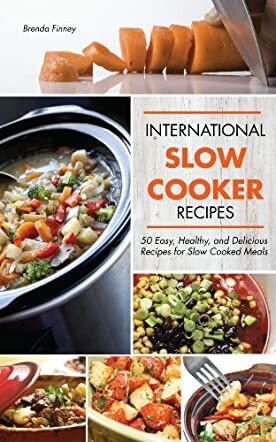 International Slow Cooker Recipes by Brenda Finney is a cookbook filled with really great recipes from around the globe. You will find recipes from the Mediterranean and Middle East; as well as Mexican, Italian, Caribbean and German meals, all cooked in a slow cooker. If you enjoy cooking in a slow cooker, this is a fantastic cookbook to have and the recipes are wonderful. I tried some and know how good they taste; others I read and they sound delicious. There are several pot roast recipes from different countries that I tried, and they are mouthwatering good. The Low-Fat Cheesy Mexican Chicken is awesome, and the other Mexican recipes really sound great. In the Italian section, the Pot Roast is wonderful, and the Lasagna is very tasty. Everything I tried was so very good that I will definitely be making these dishes again. And there are a lot more I want to try. The slow cooker makes these dishes so convenient; you just fix them and leave them to cook. Most of these take a few extra minutes of preparation time, but the reward is opening the slow cooker and having dinner already cooked when you come in from work with a hungry family. International Slow Cooker Recipes is in eBook format so it can be purchased and downloaded immediately. Some kind of introduction in the beginning would have added to my enjoyment of the book. In addition, pictures would have taken this cookbook to another level. Overall though, I encourage you to give it a try. Even if you only find a few recipes you like, it will be worth it.